Back-Up Story: "The Origin of Parallax"
In the Palmerverse, an insect queen, Queen Belthera, presides over an imprisoned Jason Todd and Donna Troy. Belthera reveals she has Ryan Choi - the new Atom - imprisoned in a magic sphere and she uses her magic to turn him into an insect. Mary Marvel, being watched by Eclipso, fights Zatanna. Zee turns Mary's lightning back on herself and Mary turns back to Mary Batson. She's magically shunted off the Shadowcrest property, which then vanishes forever from her sight, leaving Mary alone and powerless. At the JLA satellite, Jimmy Olsen - Mr. Action - was beaten up by the JLA'ers in their attempt to test his powers. But, because they all held back, Jimmy's powers didn't kick in and they were able to hurt him. He even had heat vision burns in his abdomen inflicted by his best pal, Superman. Superman tells Jimmy they ran diagnostics on him and that, notwithstanding what Jimmy says is happening to him power-wise and knowledge-wise, Jimmy appears perfectly normal and non-super. Jimmy wants to be alone. In Metropolis, Holly is placed in battle armor for a so-called "purification ritual". Athena turns all the women loose on one another in battle. Holly defeats them all except for one strangely hooded combatant. They face off against each other. Meanwhile, in Nebraska, Equus is holding Una captive. Una flips the beast and then she and Karate Kid tag-team it as Mr. Orr watches. Mr. Orr speaks to a shadowed figure, indicating that he may be working for or with Checkmate. Orr reveals himself to Karate Kid and tells him he has the answers he's looking for. The Monitors discuss the danger of letting Kyle Rayner live. Back in the Palmerverse, Donna escapes from the magic prison. She's blasted from behind by an entranced Bob the Monitor. Belthera plans to take over all of creation using the Monitor's power. First Hal Jordan is Parallax. When Hal is reborn as Green Lantern, it's revealed that Parallax is a fear entity. Now Kyle Rayner is possessed by Parallax. 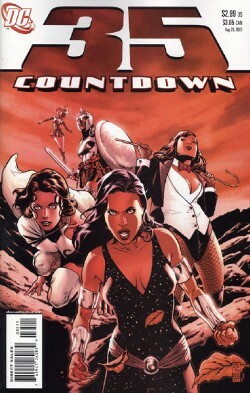 Main Story - 2: Every issue of Countdown feels like a trailer for the next issue and this one is no exception. Too little story exposed. Too much left in the dark. Too uninteresting till next issue. More piecemeal nonsense to come. On top of all this nothing, there's the mistake heard 'round the internet this week - Vixen shown channeling animal powers when she just admitted in "Justice League of America" that she's unable to do that anymore. Finally, isn't it great to see Equus and Mr. Orr again? Ya, I don't think so either - that was sarcasm. I barely stomached them the first go-round in that horrid "For Tomorrow" storyline. Which sub-par Superman foe will "Countdown" unearth next? Conduit? Main Art - 2: The art feels rushed and sloppy. On the plus side, it matches up well with the story. In particular, female characters don't look like distinct personalities - they simply have different color hair and slightly different hairstyles. The only reason I give the art a "2" is because of Giffen's breakdowns. However, even Giffen's breakdowns are getting predictably dull in their juxtaposition of background and foreground characters (to wit, the last page of the main story, the panel with Jason looking down at the entranced Bob the Monitor - been there, done that, back in early issues of "52" it would've been different; now not so much). Back-up Story - 4: This is a well-done, concise secret origin story. But let's be real - who needs a secret origin of Parallax if they're reading such a continuity heavy title like "Countdown"? Kind of a waste of space, albeit a well-written one. Back-up Art - 4: And a pretty waste of space too - but still nothing we haven't seen before. Cover Art - 2: Once upon a time, cover artists discovered a novel way to use color on a comic book cover to simultaneously express shadows and emotional foreboding by giving everything a dull red glow. Once upon a time, this method of rendering comic book covers was creative and interesting. Once. Upon a time. But that was then and this is not.